Get more practice with medical assisting competencies and test your critical thinking skills! 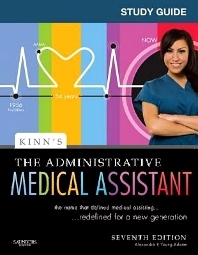 Designed to support Kinn's The Administrative Medical Assistant: An Applied Learning Approach, 7th Edition by Alexandra P. Young-Adams, this study guide offers a complete review of content and a wide range of exercises to help you master CAAHEP and ABHES competencies. A variety of exercises test your knowledge and critical thinking skills, including vocabulary review, multiple choice, fill in the blank, and true/false questions. The most current content and competencies associated with CAAHEP and ABHES are included, such as emergency preparedness, patient education, and documentation. Procedure checklists allow you to tear out each sheet and provide to your instructor for evaluation. Exercises are cross-referenced to the Connections themes in your textbook. Additional exercises enhance the learning experience with skills and concepts, word puzzles, case studies, work applications, and Internet activities. English-Spanish terms help bilingual students master the content. Work products may be submitted to your instructor and to accrediting organizations as documentation that a competency has been completed.